Here at History Box, there is a combined total of 57 years of experience, working within the archive world, specialising in the production of copies of seals and the repair of the originals. 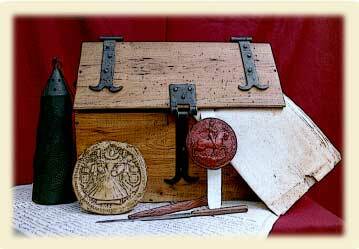 Our vast range of hand made reproductions include - great Seals, Royal and Personal seals, Ecclesiastical, Monastic and also town seals. As the list of copies available is too extensive to put on the website, we will constantly be changing the images shown. We will also be introducing some “Limited Editions” to coincide with various Dates and Anniversaries. It is also our intention to increase the range of items available to include other Museum quality handcrafted reproductions of historical artefacts. Museum and Trade enquiries welcome.